Companies have low visibility into their public cloud environments, and the tools and data supplied by cloud providers are insufficient, according to The State of Public Cloud Monitoring, a report sponsored by Ixia. Lack of visibility can result in a variety of problems including the inability to track or diagnose application performance issues, inability to monitor and deliver against service-level agreements, and delays in detecting and resolving security vulnerabilities and exploits. "This survey makes it clear that those responsible for hybrid IT environments are concerned about their inability to fully see and react to what is happening in their networks, especially as business-critical applications migrate to a virtualized infrastructure," said Recep Ozdag, GM and VP, Product Management in Keysight's Ixia Solutions Group. "This lack of visibility can result in poor application performance, customer data loss, and undetected security threats, all of which can have serious consequences to an organizations' overall business success." ■ Public cloud environments are difficult to monitor: Less than 20 percent of IT professionals reported they had complete, timely access to data packets in public clouds. In private clouds, the situation is better, with 55 percent reporting adequate access. In on-premises data centers, 82 percent have the visibility they need. 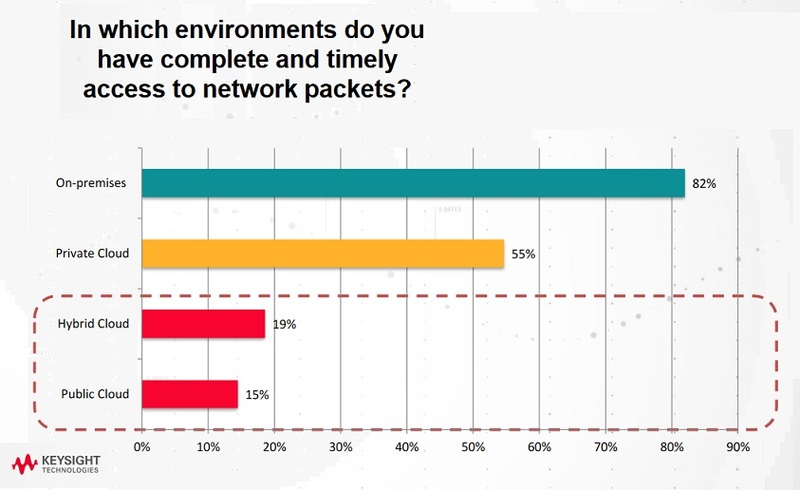 ■ Packet-level visibility is critical for monitoring: 86 percent of respondents stated visibility was important for network and application performance monitoring, and 93 percent stated it was valuable for security. ■ Predicting performance is a key challenge. 87 percent of cloud users find it difficult to predict application performance in the cloud. Methodology: The survey was conducted by Dimensional Research and polled 338 IT professionals at organizations from a range of sizes and industries globally.